Turkey’s role as energy hub: a sustainable future? Turkey is at the ultimate crossroads: the largest deposits of oil and gas in the world to the East and one of the world’s largest energy consumers to the West, writes Nicole Leonard in this first article of our new column “Middle East oil & gas”. He laughed and assured me, Turkey does not have any oil. Considering the amount of oil and gas that lies beneath the Middle East, Turkey missed out on some serious black gold after the fall of the Ottoman Empire left much of the Middle East’s oil to newly formed states. Except for a trivial 270 million barrels (as of January 2011) in the southeast and some largely unsuccessful natural gas exploration efforts in the Mediterranean, Turkey has no oil or natural gas reserves. Despite being energy poor, though, Turkey is an incredibly important player in the global oil and gas industry. Turkey is at the ultimate crossroads: the largest deposits of oil and gas in the world to the East, comprising of over 70 percent of the world’s energy reserves, and the European Union, one of the world’s largest energy consumers, to the West. It connects the East with the West and the North with the South, and all regions with the Black Sea, the Mediterranean, the Persian Gulf, and the Caspian Sea. Whereas geography has made countries like Saudi Arabia and Qatar extremely wealthy from natural resources, geography has blessed Turkey with centrality. A location that allows Turkey to profit immensely from transit fees and to act as an intermediary, selling oil and gas from the East to the West at a profit. This is far from breaking news – Turkey’s role as an energy hub has been analyzed and debated for decades. But now the energy industry is shifting dramatically and Turkey will either become far more important or far less important in the next few decades. Two new and unfolding developments have the potential to catapult Turkey to an even more distinguished and indispensable position in the global energy industry: Iraq’s reemergence as a major oil producer and the increased demand for natural gas. Iraq’s port of Basra is somewhat reliable at best and requires extensive modernization for Iraq to increase its capacity for exports and is vulnerable to rough weather and technical problems. Therefore, if Iraq wants to increase its energy exports, it will be forced to turn to Turkey. More oil will be pumped from Kirkuk in Northern Iraq to Turkey’s eastern Mediterranean port of Ceyhan, and another pipeline from Basra to Turkey’s energy port is in the planning stages. Turkey has also partaken in bilateral agreements with the Kurdistan Regional Government (KRG) to build a pipeline from Kurdistan to Turkey’s Mediterranean ports in order to transport Kurdish oil. In the meantime, Kurdistan has been trucking smaller quantities of oil overland to Turkey. Turkey’s relationship with the KRG angers the central government in Baghdad, so it will prove immensely important for Ankara to employ exceptional diplomatic competence to maintain a business relationship with both Baghdad and the KRG. Turkey also stands to benefit from the increase in demand and increase in exploration (and discovery) of natural gas. There is an abundance of natural gas in both the Caspian and the Middle East, and the country’s ideal location will be important in the transportation and distribution of this natural gas. On the other hand, regional unrest in the Caspian and the Middle East and energy exploration in the Mediterranean has the potential to derail Turkey’s enhanced global position. The Middle East is the most tumultuous region in the world, plagued by sectarian and ethno-religious violence. The Caspian countries are not particularly stable either; remember the Russo-Georgian conflict in 2008 and the recent political unrest in Azerbaijan and Kazakhstan. Conflict in the Middle East or the Caspian has the potential to disrupt supply, and Turkey could be left without a major import and a major export. 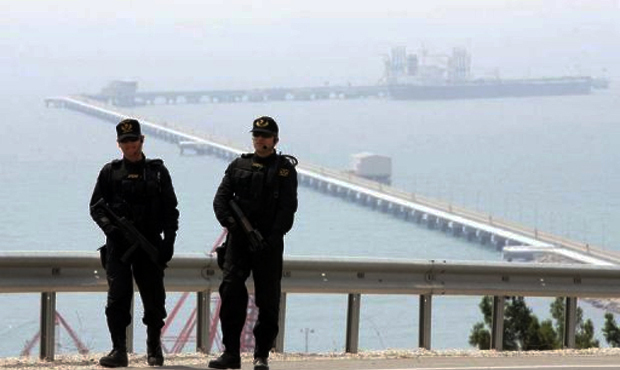 Turkey also faces domestic security challenges that have and may continue to disrupt the transportation of oil and gas. In 2008, a PKK (Kurdistan Working Party), a rebel group in Turkey, bomb closed the Baku-Tbilisi-Ceyhan (BTC) pipeline for almost a month, and in 2012, there were another two explosions along the BTC pipeline, attributable to the PKK. The Kirkuk-Ceyhan pipeline has also fallen victim to terrorism and sabotage in the last ten years and still requires major repairs in order to reach its full capacity. Finally, huge deposits of natural gas have been discovered in the territorial waters of Jordan, Israel, and Cyprus, developments in the Mediterranean that bypass Turkey’s energy infrastructure. Unless Turkey engages these countries through investment and cooperation, they could be entirely left out of this new frontier in natural gas. Turkey’s key to maintaining its role as an energy hub is proactive diplomacy, especially with Iraq and its neighbors in the Mediterranean, and an investment in internal dialogue with rebel groups with the goal of minimizing domestic risk. Turkey may be energy-poor and energy-hungry, but its potential to influence the global energy industry is great.